If you are going to Maghreb and worrying about whether or not there will be enough tasty food for you to enjoy as a vegetarian, then stop being concerned. Algerians, Moroccans and Tunisians do love their meat, and often serve meat in their main meals, but there are many delicious options for you as a vegetarian! Here are some of our ideas for yummy vegetarian foods and somethings that you might want to avoid. Maghreb has a huge variety of delicious salads, fresh or cooked. At one restaurant that my family loves, we have been served 20 different salads at one meal! At every meal that you eat, there will be salad, whether it comes as a sort of first course before the main meal or is served with the main meal on little plates. They are loaded with spices and are all very flavorful. Some people have said that they could live on Maghrebi salads alone during their trip to Maghreb ! Some salads in Maghreb are eaten with forks and others are eaten with the delicious bread that is served at every meal. Generally, the cooked salads are eaten with bread, but you can choose to do whatever you would like as they are yummy either way. The bread in Maghreb is wonderful beyond compare. You will probably eat khobz the most, which is the flat round bread that most Maghrebis use as their silverware with the main meal or salad. However, there are other types of bread that you can try! Since Maghreb was colonized by France, you will also be able to find fresh baguettes and croissants. I think you will find that these all make perfect breakfast foods and some of these will be served at the hotels that you visit. 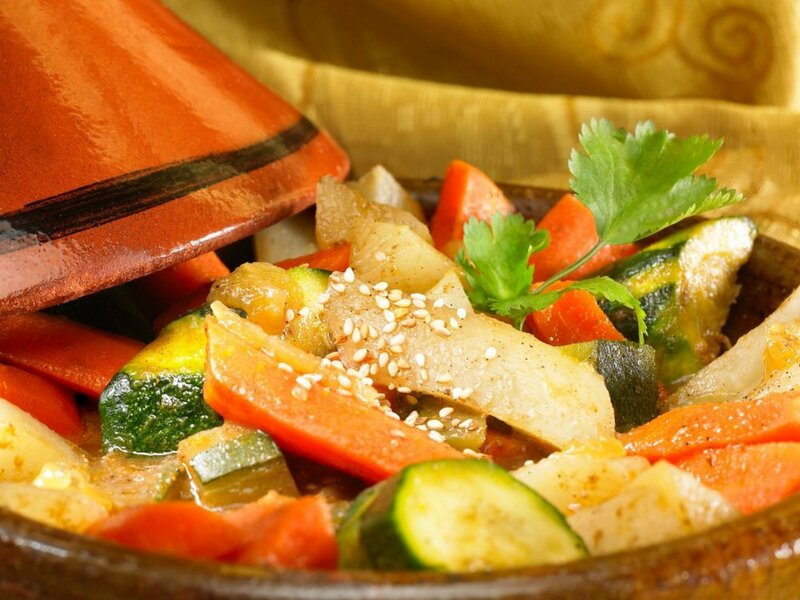 Vegetarian Tagine is basically vegetables, olives and spices that have been cooked in a delicious broth. You will find potatoes, carrots, chickpeas, and onions on it almost every time. Sometimes there will also be zucchini or squash, depending on what is in season. There might be olives and lemon on it to flavor it, or if you get the sweeter tagine, there would be raisins on top. No matter what is on it, this is a good warm meal to fill you up as you explore the Medinas and beautiful cities of Maghreb! Vegetarian Couscous consists of the seminola grains steamed above vegetables. Again, you will be treated to all the vegetables that are in season, with chickpeas and a sometimes spicy broth. This is one of the only main meals in Maghreb not eaten with bread! Other main meals that you will definitely want to try to sample during your travel to Maghreb are lentils(known as addis) and Loubia which is basically white kidney beans cooked in a tomato based sauce. You can also order the Maghreb soup, harira, without meat. This soup comes filled with chickpeas, lentils, rice and herbs-very filling and cheap! Bisara is the thick split-pea soup that is also very cheap and well-liked. There are no end to the delicious snacks that you will have access to on your trip to Maghreb. Maghreb’s fruit markets are unbeatable for both price and quality. Maghreb also has many wonderful dried fruit options that my kids love to eat: chewy dates, figs, dried apricots, prunes and more. You will pass stores that sell a range of salted nuts and other snacks that you can pick up along the way! Try the Berber figs (prickly pears) or the corn that is being roasted on the side of the road for some variety! Olives are another highlight of travel to Maghreb. There are spicy olives, sour olives and bitter olives-really any kind of olive that you can imagine! 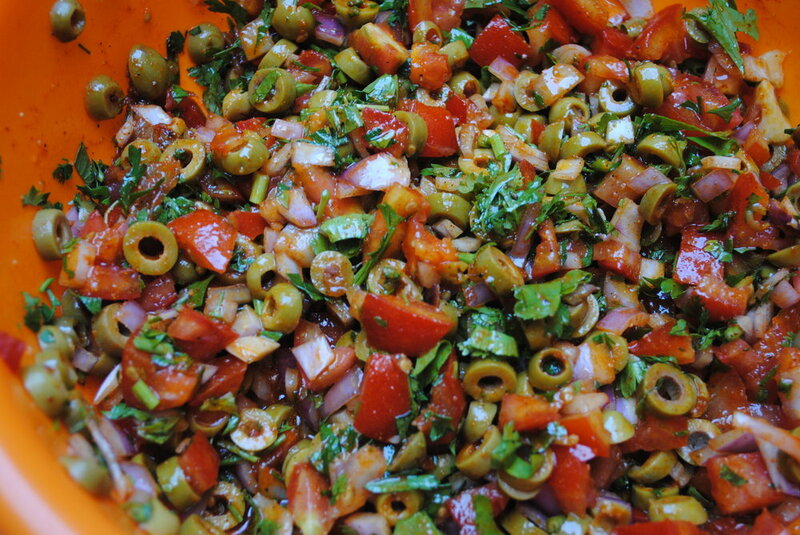 Small dishes of olives might be served with the salads at the beginning of the meal, or garnishing the tagine. Tourists have been known to bring bags of the spicy olives back to their home country as they can be so addictive! A snack that visitors to Maghreb love are their fruit salads. Fruit salads are made from whatever fruits (and nuts sometimes) that are in season in either an orange juice base or a creamy avocado base with milk and sugar added. They can be considered a meal in and of themselves! You can also get plain fresh squeezed orange juice or mint tea for other wonderful drinks. Many of them have a nutty flavor and are quite beautifully designed. These are served with tea at the end of a meal. Try the shbakia which is made of fried batter dipped in honey. Sfinj are the Moroccan donuts that are sometimes dipped in sugar. Seasonal fruit is a healthier dessert option at many restaurants and homes. Here are some things that you should consider and be careful of if you are a vegetarian going to Maghreb. Maghrebis might not understand vegetarianism. Meat is a sign of wealth to them, and it is considered hospitable to serve meat to you. Therefore your request may not be understood at a restaurant. Harira and Chorba, soup, is sometimes made with meat. This is another dish where the meat may simply be removed.